Most of us ask how often an air-conditioner needs to get a maintenance service done. The common answer you get from many experts is at least once a year. You don’t even need to suspect something is wrong as long as you schedule it at some point. This ensures that you have to an efficient AC unit operating throughout the year. All the accumulated dust and dirt will be gone to prevent irreparable damage to your machine’s parts. It will cool your house or space the best it can for several months. Scheduling maintenance work is pretty easy to do. You just hire a service provider to inspect and perform the necessary maintenance work to your unit. The rates vary from the cleaning or repair method that they perform which solely depends on the state of your machine. Obviously, the more thorough the cleaning or the more parts they repair/replace, the more expensive it’s going to be. Learn the most common processes done to your AC unit to maintain its energy efficiency and extend its service life. With AC systems operating for long hours, dust and dirt clog key part of the system. The condenser coil and filters are the most common affected parts. This build-up directly affects the overall performance of your unit. Preventive maintenance is needed to take it back to an efficient state. You do that by a scheduled inspection by professional technician. They need to be a licensed expert to make sure that you find problematic parts and clean the key parts from clogging. In a normal inspection, important parts like the drainage system, temperature and pressure operation, condenser, compressor motor, fan, and all connecting pipes are being checked. They identify what needs to be cleaned to improve its performance. 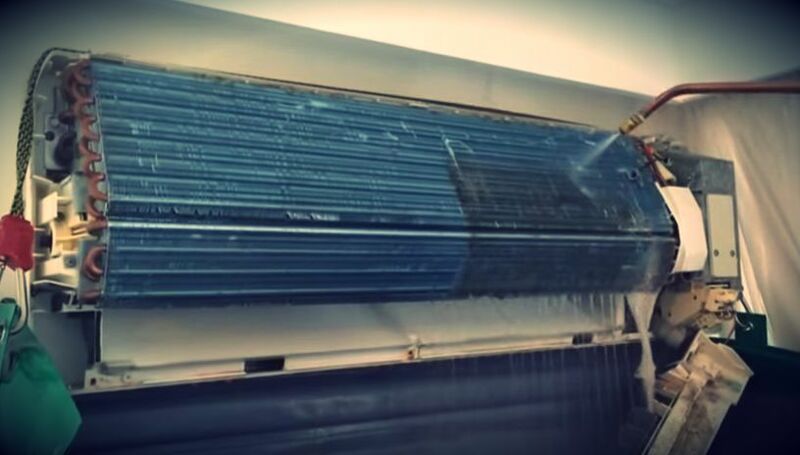 Chemical washing is a thorough cleaning process where the technician dismantles the whole unit to clean every part of the AC using chemical reagents. The process will start with the condenser, coils, and the air filter/s. A chemical solution will be mixed up in a container where the parts will be placed for a few minutes to get rid of the hard to remove particles that have accumulated inside the pipes. The entire drainage system including the pipes will receive a chemical flush as well. This method brings the unit back to almost full efficiency like it’s a new unit. It is recommended that owners have this done to their unit once a year. If you have unit that hasn’t been used for a while, before turning it back on make sure it undergoes a chemical wash to make sure it runs well the first time you turn it back on. Inspection might lead to a full overhaul if a technician finds key parts that need replacement. You keep the unit running on parts in great condition. This prevents early deterioration and damage because of faulty parts. This can be very expensive though because technicians might find components that need replacement and they sell at a high price in the market. Find a repair man that can tell you it’s worth the investment or not. If it’s worth it, you get to extend the AC’s service life. If it’s not, then, it’s time to buy a new unit.